Schenscher has appeared in 10 games since joining Chicago and averaged 2.2 ppg and 2.0 rpg. March 25, 2006 — The Chicago Bulls today signed rookie Luke Schenscher for the remainder of the 2005.06 season. Schenscher joined the Bulls from the D-League’s Fort Worth Flyers on March 5 when he signed his first 10-day contract with Chicago. He then signed his second 10-day on March 15. 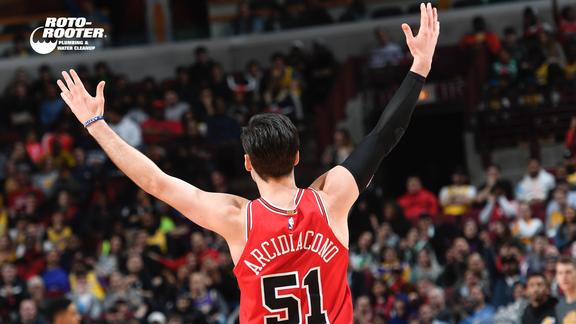 The 7-1, 265-pound center has appeared in 10 games since joining Chicago and averaged 2.2 ppg and 2.0 rpg in 9.2 mpg and shot .769 from the floor. Chicago’s roster now stands at 15. March 15, 2006 — The Chicago Bulls today re-signed rookie Luke Schenscher to a second 10-day contract. The 7-1, 265-pound center has appeared in five games since joining Chicago on March 5 from the D-League’s Fort Worth Flyers. With the Bulls he has averaged 2.8 ppg and 1.6 rpg in 8.6 mpg while shooting .778 from the field. In last night’s 95-66 win over Portland, Schenscher registered season-highs of 10 points (5-6 FG) and four rebounds in 17:18 of action. March 5, 2006 — The Chicago Bulls today signed Luke Schenscher of the NBA Development League to a 10-day contract. Schenscher, a 7-1, 265-pound center, will be with the Bulls tonight when they visit the Cleveland Cavaliers at Quicken Loans Arena at 6:30 P.M. CT.
Schenscher joins Chicago from the Fort Worth Flyers of the D-League, where he has averaged 8.2 ppg, 6.1 rpg, 1.42 bpg and 1.2 apg in 36 appearances (34 starts). He has shot .530 from the floor and .607 from the free throw line. The Australian native played four seasons at Georgia Tech (2001-05), including a key role in the Yellow Jackets’ run to the 2004 Final Four. In 119 games at Tech he averaged 7.3 ppg, 5.4 rpg and 1.32 bpg.